Brewer Adnams (ADB) increased its revenues last year, but it reported a loss. Beer volumes grew by 2.2% and revenues were 6% ahead at £78.9m. The loss of £877,000 was after £1.77m of pension and property impairment costs. The final dividend is unchanged at 150p per B share. Adnams is optimistic about the proposed government review into small breweries relief – if Adnams paid the same duty rates as small brewers it would save £7m a year. Altona Energy (ANR) has net assets of £11m, but these are predominantly intangible assets. There are also £19.8m of potential tax losses. Altona is re-evaluating its underground coal gasification project in South Australia and assessing an investment in a Chinese vanadium mine. The net liabilities of Welney (WENP) increased from £234,000 to £301,000 in 2018. This is being funded by loans from directors. Costs have been kept low as management seeks a suitable acquisition. Churchill China (CHH) improved margins last year. Revenues were 7% higher at £57.5m, but underlying pre-tax profit was 26% higher at £9.4m. Growth in exports is a major factor and they account for three-fifths of revenues. Retail sales fell and hospitality sales increased by £5m. The total dividend was raised from 24.6p a share to 29p a share. There was £14.4m in cash at the end of 2018. Cloud-based communications software provider Cloudcall (CALL) increased recurring revenues by one-third last year and total revenues were 28% ahead at £8.8m. The fastest growth was in the US. The cash outflow from operations increased from £1.57m to £2.38m. This is due to higher operating costs in terms of product development and marketing. Frontier IP (FIPP) has increased the value of its portfolio of investments by 27% to £11.5m in the six months to £11.5m. NAV is 38.8p a share. The deal by investee company Exscientia, which is involved in AI-based drug discovery, with Celgene Corporation should result in a substantial uplift in its valuation in the current six month period. Parity (PTY) says it has lost a major contract with the Scottish government, but it should not have a significant effect on profit because it is low margin. This year’s revenues will be 10% below expectations. The 2018 results will be announced on 16 April. Rambler Metals and Mining (RMM) has launched a one-for-one open offer to raise up to £1.7m at 1.4p a share and it closes on 12 April. This follows the £8.4m placing at 1,4p a share, which raised cash to pay off debt and provide working capital. Alliance Pharma (APH) improved its pre-tax profit from £23.9m to £28.1m. This excludes a £1.9m write down of an acquired intangible relating to a manufacturing supply contract. A pre-tax profit of £32.8m is forecast for 2019. Funds managed by Epiris LLP have launched a recommended cash offer of 193p a share for Ireland-based financial services group IFG (IFP), valuing it at £206m. Ovoca Bio (OVB) is increasing its stake in IVIX to 59.9%. The additional 9.9% costs $2.04m. IVIX’s drug Libicore has met the pre-specified primary efficacy endpoint and significant outcomes in secondary endpoints as part of its phase 3 clinical trial for the treatment of hypoactive sexual desire disorder. Standard list shell Baskerville Capital (BASK) still had £1.54m in the bank at the end of 2018. Potential technology acquisitions are being assessed. Blockchain Worldwide (BLOC) is still seeking an acquisition after the deal to buy Chorum fell through due to weak stockmarkets. There was £1.21m in the bank at the end of 2018. Sativa Investments (SATI) is acquiring a 51% stake in George Botanicals from Carbon Managers, where Sativa boss Geremy Thomas is 100% owner, for £200,000. Thomas was not involved in the decision making concerning this investment. He was the founder of former AIM company PNC Telecom and invested in George Botanicals before Sativa was set up. George Botanicals supplies cannabidiol (CBD) products, such as vape pens, balms and edible gels. Non-executive director Noel Lyons has sold 750,000 shares at 3p each. He still owns 2.25 million shares. This should have generated more cash than his initial investment, assuming he bought shares in the directors subscription at 0.5p each. Mandicon (MECP) intends to return 250.125p a share in cash to investors via a solvent liquidation. An offer of £1.1m has been made for the remaining business, Nirvana Engineering, but the board believes it is worth £1.5m. Chairman Wilf Boardman will not receive the cash distribution and instead he will receive the balance of cash left after the liquidation costs and take control of Nirvana and have the right to potential deferred consideration of £400,000. Even taking Nirvana as being worth £1.5m, Boardman will receive the equivalent of slightly less than the cash distribution to the minority shareholders. Primorus Investments (PRIM) says that investee company Sport:80 has commenced the preparation of documentation for a flotation that could happen in the third quarter. Non-executive chairman Jeremy Taylor-Firth has acquired an initial holding of 12.5 million Primorus shares at 0.1585p each. Ganapati (GANP) says that iSoftBet will be integrating its Japanese-themed games to the Game Aggregation Platform. This means that these Ganapati games can be delivered to operators via the platform. Robert Dowling has been appointed as chief commercial officer. All Star Minerals (ASMO) continues to review investment opportunities. The company owns 1.92% of NQ Minerals (NQMI). National Milk Records (NMRP) chief executive Andy Warne has taken up the options for 85,000 shares at 28p each and then sold 27,200 shares at 87.5p a share. Two other managers, Jonathan Davies and Ben Bartlett, each took up 50,000 shares at 28p a share and each sold 16,000 shares at 87.5p a share. Panther Metals (PALM) has changed the general meeting date to 11 May. Etaireia Investments (ETIP) is investigating a number of transactions undertaken by Baron Bloom before his resignation as a director. These cover acquisitions totalling 16% of the company’s assets. Immunodiagnostic Systems Holdings (IDH) is making a habit of putting out statements late in the day and sometimes at the end of the week. The latest is a trading statement released at 4.35pm last Friday. Full year revenues are 5% lower at £37.9m and also below the 2015-16 level, which was a previous low point when the reported loss was nearly as high as the revenues. There was around £28.5m in the bank at the end of March 2018, compared with cash of £29.7m (and debt of £1.33m) at the end of September 2017. The preliminary results are due to be announced on 20 June, possibly at an earlier time, although the interim figures were published at 4.30pm on Friday 24 November. Management will undoubtedly be bemused why the share price is so low, immune as they appear to be from a good sense of investor relations. Aviva has sold its 3.92% stake in Vernalis (VER) and GAM cut its stake below 5%. Stockholm-based HealthInvest Partners has bought a 5.69% stake. Vernalis had £46m in the bank at the end of 2017. US commercial cough treatment activity should finish by the end of September and that will slow the rate of cash outflow. A formal sale process for the company has started. Bad news from Immupharma (IMM) concerning the phase III trial of lupus treatment Lupuzor. The performance against the placebo was not good enough to meet the required target. There is still potential for a treatment targeted at specific sections of lupus sufferers. Lanstead Capital has sold its 5% stake and Aviva has cut its shareholding from 7.27% to 4.4%. Integumen (SKIN) plans to acquire Cellulac via an all share reverse takeover. Cellulac provides the group with operations involved in biodegradable plastic ingredients and food supplements. The shares issued for the acquisition will account for 84% of the enlarged share capital. There are also plans to raise £7.5m. Gerard Brandon and Camillus Glover will become chief executive and chief operations officer respectively. Declan Service has resigned as chief executive. The current business will focus on existing products. ClearStar, Inc (CLSU) is regaining the confidence of investors with further growth in revenues and progress towards profit. In 2017, revenues improved $16m to $17.8m and the loss was reduced from $2.11m to $1.95m. In 2018, the loss is expected to halve to $1m and it could breakeven in 2019. Net cash is $1.3m. N4 Pharma (N4P) has commenced the proof of concept clinical trial for sildenafil, which should take eight to ten weeks. Initial results should be available in July with the final study at the end of August. This will show whether the reformulation is successful and how the performance compares to Viagra. Connemara Mining (CON) says that the maiden mineral resource estimate for the Stonepark zinc lead project is 5.3mt at 8.55% zinc and 2.6% lead. The mineralisation is relatively shallow. Connemara has a 23.44% stake in the Stonepark project and Group Eleven Resources owns 76.56%. SkinBioTherapeutics (SBTX) says that the cream formulation of its SkinBiotix technology has proved effective on skin models. Stability testing is underway. Property fund manager First Property Group (FPO) says its full year pre-tax profit will be in line with expectations. Funds under management have reached £625m. The Universities Superannuation Fund has sold its 8.58% stake. Production grades declined in the third quarter at the Uruguay mines of Orosur Mining Inc (OMI) and production was lower than expected at 6,859 ounces of gold. Full year production should be more than 27,000 ounces. Orosur generated $6.3m of cash from operations in the nine months to February 2018. Filta Group Holdings (FLTA) reported growth in continuing revenues from £8.5m to £11.5m with the grease management business making an initial contribution. The figures exclude the refrigeration activities which have been sold. Underlying pre-tax profit improved from £831,000 to £1.73m. The main growth came in the North American franchised fryer management operation. Filta has bought the German master licence and this will provide a base from which to grow in Europe. The strategy is the same as in North America. The total dividend for the year is 1.3p a share. Rose Peteroleum (ROSE) believes that the total cost of the first well on its project in the Paradox Basin in Utah will be in the range $7m-$8m, which is lower than previously thought, and it could be less than that. Ascent Resources (AST) is reviewing its strategic options. A partner could be sought to help to exploit the existing gas assets. There is already interest from potential partners. Ascent still has cash of more than £1m. Draper Esprit (GROW) has more than doubled its gross portfolio value to £244m in the year to March 2018 as it invests the cash it raised in the period. There is still £56m to invest and the funds managed by the group have a further £50m. Profit has bounced back at Christie Group (CTG) thanks to a sharp recovery in the professional business services division. The stock and inventory systems division made a larger loss. Overall pre-tax profit improved from £1.8m to £3.15m, although the outcome as flat excluding the previous year’s exceptional pension-related charge. In the six months to January 2018, Egdon Resources (EDR) produced 17,962 barrels of oil equivalent. That was higher than the previous year but revenues were flat at £513,000. There is £4.1m in the bank. Full year pre-tax profit fell from £908,000 to £730,000 at Tex Holdings (TXH) but NAV increased from 155p a share to 168p a share. The NAV improvement came from a reduction in the group pension deficit. Net debt increased from £3.75m to £4.87m. The plastics division improved its profit but the engineering division was hit by relocation costs. The dividend has been maintained at 8.5p a share. Chris Gray, who is in his seventies, is replacing Richard Burrows as chairman. David Redhead has switched from non-exec to executive director. Sanity has not taken over when it comes to the share price of standard list shell AIQ Ltd (AIQ) following the return from suspension. The suspension price was 125p a share and it ended the week at 130p a share, having fallen to 92.5p a share the previous day. AIQ raised £115,000 at 20p a share in order to help to improve the limited liquidity of the shares. A one-for-40 open offer at the same share price could raise up to £253,000 more. In January, £4m was raised at 8p a share. Sealand Capital Galaxy Ltd (SCGL) is selling SecureCom Media Holdings to Creative Alpha Ltd for £10,000, having acquired the business for £1m plus 10 million shares at 20p a share just over one year ago. Boston International Holdings (BIH) had £811,000 left in the bank at the end of 2017. There was a £400,000 cash outflow during the year. Spinnaker Opportunities (SOP) had £1.18m in the bank on 13 April 2018. AIM-quoted Rare Earth Minerals (REM) has announced its intention to gain a secondary quotation on ISDX on around 28 October. Executive chairman David Lenigas says that the shares will continue to be traded on AIM. REM has increased its shareholding in ASX-listed European Metals Holdings Ltd, which owns the exploration rights to the Cinovec lithium/tin deposit in the Czech Republic, to 11.07%. REM paid £170,640 for two million shares in European Metals plus two million warrants exercisable at A$0.20 for a 12 month period. Lenigas is also a director of AfriAg (AFRI), an AIM company that has already started trading on ISDX, and Evocutis, which expects to start trading on 19 October. AIM-quoted Sefton Resources says that it investigated the possibility of moving to ISDX if, as appears inevitable, it loses its AIM quotation but says it was not a viable option. This shows that ISDX will not just take any AIM company that wants to move to its market. Another David Lenigas and Donald Strang vehicle, Leni Gas Cuba Ltd (LGC), has launched a pathfinder prospectus. LGC has already raised £4.525m prior to the flotation. Most of this cash was raised at 2p a share but the majority of shares in issue at the end of July 2015 were issued at 0.01p a share. BVI-registered LGC intends to make investments in Cuban businesses. At this stage there is still a wide range of options in terms of sectors. LGC may also invest 25% of its funds in other Caribbean ventures. LGC has already invested in an oil and gas company and a travel company. The oil and gas investment and related options, which have subsequently been exercised at an additional cost of £100,000, are in the balance sheet at £690,000. The travel investment cost £39,000. If £500,000 of additional cash is raised in the proposed subscription at 5p a share this will provide £148,500 after costs and pro forma cash would be £3.56m. Global Investment Strategy (UK), which is owned by AIM-quoted Octagonal (OCT) where Lenigas and Strang are former directors, currently owns 4.1% of LGC. Cash shell Chalkstream Investment Company (CHLK) intends to leave ISDX on 14 November. At 0.115p (0.1p/0.13p) a share, the shell is valued at £900,000. There was £621,000 in the bank at the end of May 2015. There was a six month cash outflow of £58,000. The ultimate beneficial owners of Chalkstream are property company director Robert Ware and former Numis media analyst Dominic Buch. Chalkstream joined ISDX on 17 May 2013 when it raised £330,000 at 0.1p a share. There was £754,000 in the bank at that point. Chalkstream was seeking to buy a UK business in the services sector. Nodding Donkey (NODD) has raised £42,600 at 3p a share and this cash will cover the company’s overheads and help to finance the 86.95% owned subsidiary Equatorial Oil & Gas in its exploration activities in Botswana. The placing is at a significant discount to the market price of 7.75p (7.25p/8.25p) a share, which values the company at £11.5m. The most recent trade was on 1 October at 7.5p a share. At the end of April 2015, Nodding Donkey had £29,000 in the bank and there was a cash outflow of £114,000 in the previous 12 months – according to unaudited accounts. Last month, Equatorial was issued with three petroleum exploration licences in Botswana, which could host shale gas. One licence was issued directly to Equatorial and the other two to Equatorial’s 85%-owned subsidiary Tamboran Botswana. Equatorial has two licences for coal bed methane. Wey Education (WEYP) founder Zenna Atkins has sold her remaining stake in the educational services provider. The 1.4 million shares were sold on 14 October. The sale removes an overhang and could make the planned move to AIM easier. At 4.5p (4p/5p) a share, Wey is valued at £2m. Recruitment services provider Empresaria (EMR) is acquiring Pharmaceutical Strategies for up to $12.1m and this has led to house broker Arden upgrading its 2015 forecasts. The acquisition takes Empresaria into the US healthcare market and boosts the contribution of the sector to the group. The Massachusetts-based recruitment company specialises in pharmacy benefit managers and nurses, which is an area of growing demand in the US. There has been a slight reduction in 2015 estimates for Empresaria but the 2016 pre-tax profit estimate has been raised by 8% to £8.6m, while earnings per share estimates have been increased by 5% to 10.8p. Infection prevention products supplier Tristel (TSTL) reported better than expected figures for the year to June 2015. All parts of the business improved their revenues, particularly overseas. Underlying pre-tax profit improved from £1.8m to £2.6m. There was a special dividend of 3p a share and even excluding that the total dividend improved from 1.6p a share to 2.7p a share. A 2015-16 profit of £2.9m is forecast. Tristel is in the process of getting regulatory approval in the US. Digital video content distributor Rightster (RSTR) is undertaking a strategic review. The options include a sale of the company, divestures, partnerships or acquisitions – although this will be difficult to finance given the cash outflow from the group. The main problem is the deferred consideration that has been payable in shares and been highly dilutive. There were 137.9 million shares issued in August for past acquisition Base79 and these can be sold from 12 November with the consent of Cenkos. The shares were issued at 15p each compared with the current market price of 10.5p. A further £3.6m worth of shares are due to be issued by the end of 2015. Rightster has already issued a further 6.2 million shares for the deferred consideration of another acquisition. Staffline (STAF) has acquired Northern Ireland-based recruitment agency Diamond Recruitment for an undisclosed amount. This will enhance the group’s business in Ireland. This deal comes three weeks after the purchase of professional drivers provider Milestone. 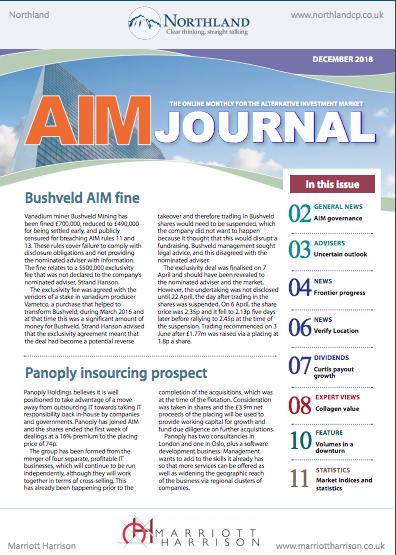 Standard list shell Mithril Capital (MITH) has announced plans to acquire Agenda 21 Digital and move to AIM. Mithril has common backers with Satellite Solutions Worldwide (SAT), which was originally shell Cleeve Capital and followed the same route. Trading in Mithril shares was suspended at 3.6p. Mithril joined the standard list on 22 December 2014 and raised £3.32m net at 3p a share and the shares initially started trading at 6.5p each. Mithril subsequently switched its investing strategy from a focus on the resources sector to the technology sector. The purchase of digital media and analytics agency Agenda 21 marks the first step in a strategy to acquire digital focused marketing services and technology businesses. The initial consideration is £3.3m – 65% cash/35% shares – with up to £8.6m in deferred consideration payable based on performance over the next three years. Advertising industry veteran Peter Scott will become chairman of Mithril. Surface treatments products and services Norman Hay has transferred its quotation from Britdaq to Asset Match. In 2014, revenues grew from £44.8m to £46.5m and underlying profit rose from £2.77m to £3.6m. Net debt was £494,000. Hay’s NAV was £18.9m at the end of 2014, just over one-third of which is intangible assets, whereas the current market cap is £14.8m – at 100p a share. That is equivalent to six times post-tax earnings in 2014. 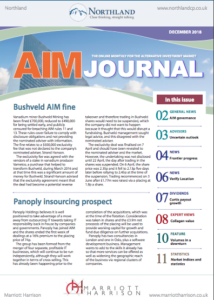 LATEST EDITION OF AIM JOURNAL AVAILABLE HERE. 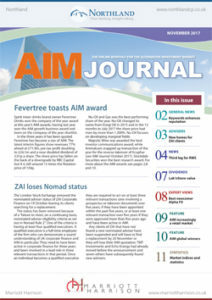 OCTOBER EDITION INCLUDES REVIEW OF AIM AWARDS WINNERS.